4-H STEM Specialist Keith Jacobs. Entrenched in front of a newly-acquired, huge flat-screen tv that serves as his computer monitor, and surrounded by his tech toys—myriad boxes of cutting-edge technology including drones, virtual reality headsets, Makey Makey kits, and 3D printers courtesy of Google, Microsoft, and other tech giants— Illinois 4-H STEM Specialist Keith Jacobs imparts his tech savvy to youth all over the state. 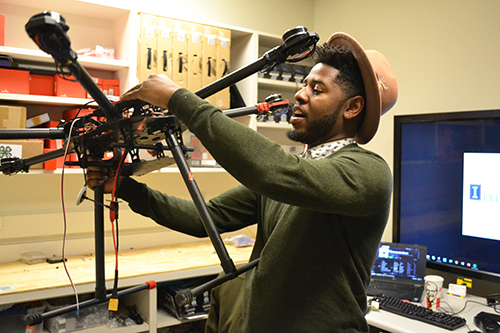 In his free time, he’s developing drones to provide medical services to folks in remote areas. And while these two passions might seem to be totally unrelated, they’re really quite interconnected. For instance, when Jacobs was in college, he couldn’t quite decide what he wanted to do careerwise. So he dabbled in this and that, studying several seemingly disparate fields, which actually contributed to his getting to where he is today. 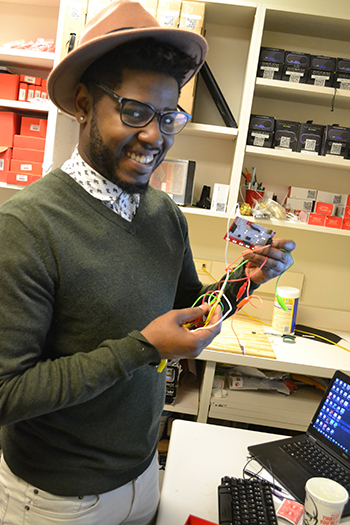 After taking a rather round-about route, he’s presently doing two things he’s quite passionate about—developing medical drones and educating young people about STEM. Bachelor’s degree in hand, he headed to medical school. However, it wasn’t long before he discovered, “This isn’t the only thing that I want to be doing for the rest of my life.” So he left medical school. That’s when his interest in aviation—specifically drones—once again took center stage. He had an epiphany, and realized that his dream job incorporated a couple of his previous interests: “Well, I want to build drones for medical purposes and start a company,” he decided. 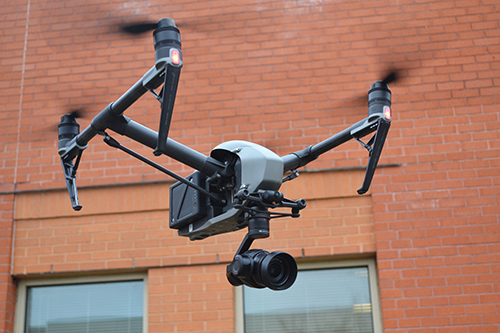 However, when drones first started gaining popularity around 2013, one couldn't just run out and buy one. One of Jacobs' toys, a DJI Inspire 2 drone. “The first drone I had, I had to build it,” he confesses. So he taught himself how to build one—a habit he's found extremely helpful in his current career at 4H. Upon hearing about his plans, his parents freaked out. “What are you doing? You're not an engineer. How are you going to do it?” He told them, “I'll figure it out.” And he did. However, at that point he also realized that people might not take him seriously regarding his dream job—medical purpose drones—and might accuse him of not being qualified. “You're just some guy that started building drones!” they might say. So he got qualified. He went back to school and got a Master's in Public Health and grad certifications in public health and environmental health, specifically epidemiology. His plan is to use ultra-high-frequency microwaves to connect people long distance. Originally, he intended that his drone would mostly be used in third-world countries, but now he qualifies that it could be used for both medical delivery as well as connectivity in rural areas anywhere in the world. 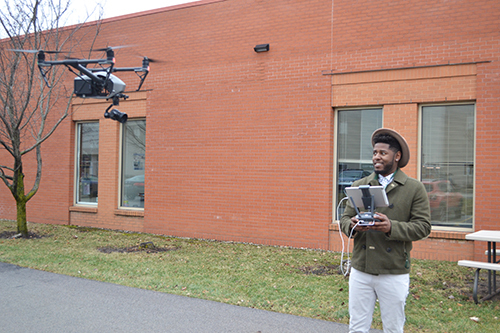 Jacobs takes his DJI Inspire 2 drone for a spin outside the Illinois Extension office. But in the meantime, isn’t Jacobs' stint as 4H STEM Specialist taking him on a major detour from his big dream—telemedi drones? Not really. Here’s why. Jacob’s passion for STEM education began when he started passing on to kids some of the technology he’d taught himself. For instance, besides teaching himself how to build a drone, he learned how to build a 3D printer. For both, he says he had to learn “a whole new set of skills.” That’s when he realized he had something today’s young people need. 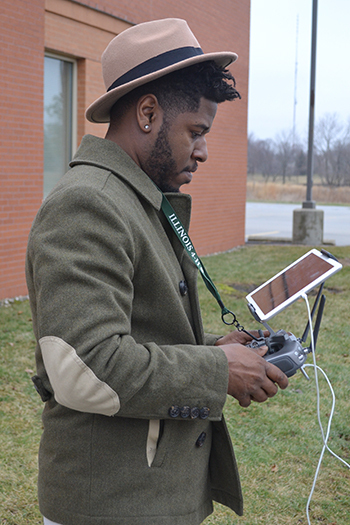 Jacobs pilots the DJI Inspire 2 drone, using an ipad to view the birds-eye images from the camera mounted on the drone. So he started working with kids. One thing led to another, and he ended up at the 4H state fair judging rockets. The experience changed his perception of what 4H was and its potential for STEM education. That was when a current colleague recommended, “Man, you should totally apply for that STEM job. There's a job that just opened. It's a STEM specialist job.” Deciding that was what he wanted to do, he applied and got the job. “And now I get to do a bunch of cool stuff!” he boasts. Jacobs exhibits another of his toys, a Tarot X6 drone. For Jacobs, writing curricula has flowed quite naturally out of teaching himself how to do things. For instance, when learning how to build drones, he would write himself notes on how to do it, because it was “stuff that nobody was doing yet, and I needed to know how to do it and document it.” For Jacobs, it’s been a simple matter of recording how to teach others to do what he’s taught himself to do. Keith Jacobs shows off one of the numerous Makey Makey kits he has available. Writing new curricula is just part of the leadership he provides for 4H STEM programming throughout Illinois. He also writes grant proposals in order to purchase different types of technology. He shares how it works. The National 4H Council gets an invitation from a company then tells the states how much money is being offering. Jacobs then writes a grant on behalf of Illinois’ 4H clubs. Finally, the Council chooses which states get to participate. “Then we get the congratulations and then we start spending the money to get the stuff out there!” he finishes. Of course, sharing the new technology is the fun part. One technology Jacob's acquired are Makey Makey invention kits—arduino-based computer chips, similar to Nintendo controllers, that use alligator clips to connect conductive things like Play-Doh and/or aluminum foil, to a computer, which can then be used to do coding and programming. Another technology his office supports is Scratch. Via a University of Illinois-developed curriculum about programming, kids learn how to create video games using the block-based coding language. Plus, as a result of 4H’s partnership with Google, in addition to spending some of the company’s money for technology, he’s been able to rub shoulders with folks from the internet powerhouse. For example, Jacobs and 4H’s STEM infrastructure appear to be a favorite go-to guy when high-tech corporations like Google want to interact with kids. “We made a lot of connections and relationships over there,” Jacobs says regarding networking with folks in Google’s Chicago headquarters. They’ll ask, “Hey, can you get 50 kids from Chicago together to do our code?” Then Jacobs and his educators supply the kids. In fact, Google recently asked Illinois’ 4H STEM team to be their sponsored organization at their volunteer week. 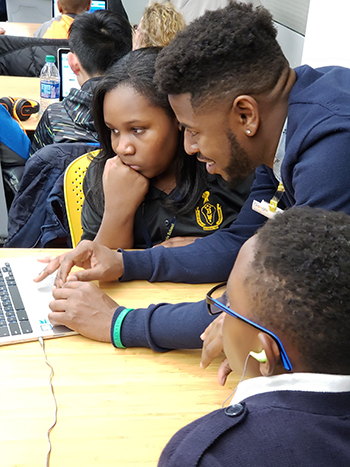 “We got to go out there and really connect our youth with this huge company, and the Google headquarters is amazing. It's like an amusement park,” he claims. Also, because of the Illinois program’s size and strong STEM activities, Jacobs and his team were asked to host the announcement of the 4H-Google partnership, which featured Google executives as well as the governor and was held at the Illinois State Fair. As lead on that grant, Jacobs and his team provided training to folks from the different states involved with the grant. Close on the heels of acquiring new technology comes another of Jacob’s duties: training educators and program coordinators from the state’s 27 4H units to confidently go into the community to do the high-tech programming with youth. So he provides educators in the field training emphasizing the specific computer technologies cited above, such as how to use Scratch. While 4H’s STEM focus is growing rapidly, the organization still has traditional community clubs where students can choose a project, such as sewing, or baking, or horses, (or hitting a pig with a stick, as Jacob surmised), then exhibit at the state fair in hopes of winning a blue ribbon. However, 4H members can also choose from an ever-growing list of STEM-related project areas. In fact, Jacobs says these have grown so rapidly that they’re still developing curriculum for them, such as his Drones curriculum. 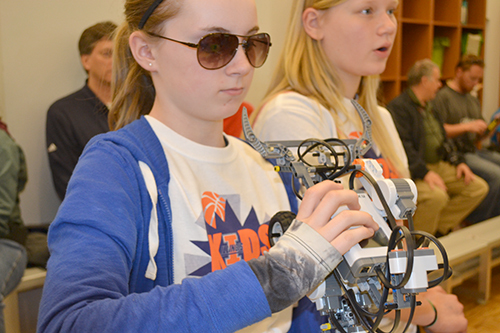 Two contestants compete in a recent 4-H Robotics Competition. In addition, 4H also has something called special interest or SPIN clubs. One of the biggies is the Robotics SPIN club, with from 500 to 650 kids competing in its end-of-the-year competition, scheduled for Saturday, May 11th, 2019, in Bloomington, Illinois. Jacobs and his Robotics Design Committee, comprised of youth formerly in robotics who now want to take a leadership role, will come up with the challenge. For example, last year’s theme was envirobots (environmental health-related robots). Teams of 3–10 kids choose from 15 different tasks, then will have from January through May 11th to program their robot to autonomously accomplish those tasks on a 4 by 8 foot mat within a three-minute time-frame. Teams have three tries to have the robot do the tasks. Jacobs peers through the telescope 4H purchased for the solar eclipse event. Illinois youth also use it to study the night sky during summer 4H camps. 4H also holds other large, state-wide events. For last year’s solar eclipse, 4H rented a minor league stadium, then projected images of the eclipse from a telescope onto the jumbotron. The 2000 participating kids and their families not only saw the eclipse, but got to do a variety of STEM activities, including virtual reality, robotics, and computer science. Jacobs and his team also do similar events in the inner city. For instance, Cook County youth are involved with robotics funded by a huge 4H grant specifically for robotics. While Jacobs has little formal training in teaching, he’s honed his skills over the years. For instance, in college, he taught science at a school for kids with cerebral palsy and neuromuscular diseases. And he’s worked with medical schools to provide summer educational sessions for youth who want to be doctors, for which he’s received a lot of training. Plus, he’s been doing community outreach for a very long time. 4-H Exposes Youth to STEM Via Informal Education.